Barnstaple RFC is located just a few minutes walk from the centre of Barnstaple in North Devon, which is itself the main town of North Devon and is believed to be the oldest borough in England dating to the 10th century. During Medieval times Barnstaple was the hub of commercial trading, a thriving agricultural industry and a bustling port which exported worldwide its wares of wool and pottery, whilst it imported spices, wine and tobacco thanks to its former river port, located at the lowest crossing point of the River Taw, flowing into the Bristol Channel. Even though the port is no longer here there is still much to admire about Barnstaple from the magnificent coastal waters and the south-west coastal path that trails them, to the splendour of the rural landscape of Exmoor national park. The town still shows signs of its medieval days, such as the September Fair Proclamation Ceremony which is the major civic event of the year in Barnstaple. and has the reputation of being one of the oldest in the country with its origins believed to date back as far as 930AD, and later still its Victorian commercial centre with a bustling high street, its Pannier Market and a richness of culture that still thrives today. Barnstaple is also known as Barum which is a part of its latin name ad Barnastapolitum. Barum was mentioned by Shakespeare, and the name was revived and popularised in Victorian times, when it was featured in several contemporary novels and this is where the name's current popularity stems from. The name can be heard being sung loud and clear by the huge support that regularly comes to matches. Barum regularly draws crowds of 500-600 every home game and the traditional Boxing day derby with our neighbours Bideford will always top 2000 attendees for the game. Barnstaple Football Club was officially founded in 1877, the same year the Wimbledon tennis tournament began, at a meeting of Barnstaple Gentleman at the Fortesque hotel. The meeting decided to play football according to the Rugby Union rules, and that the ball should be kicked off punctually at half-past three for the first game. Sadly, the report in the North Devon Gazette does not state who the opponents were in the inaugural match. “A football match was played on saturday afternoon in the cricket field at Rumsam, between 15 of the Westward Ho Club and the same number of gentlemen of this town. The game was played on Rugby principle and continued for an hour and a quarter, when only one goal had been made, and that by the Baumites. The playing was marked by great excellence on both sides and the game was most interesting to the spectators who had assembled, and who remained in spite of the incessant rain”. The first Chairman was Mr W. A. BILNEY, and he reported that he had procured the use of a field at Rumsam at a nominal rent. There were nearly thirty gentlemen who were willing to join the Club, with the first Captain elected being Mr W. H. TOLLER. This was to be a vintage period for Barnstaple Rugby in particular between the years 1894 and 1903, the club produced two England internationals (Charles ‘Nobby’ THOMAS and Charles HARPER) and for two seasons it was unbeaten at home, and won the Devon Senior Cup in 1894 and again in 1901. 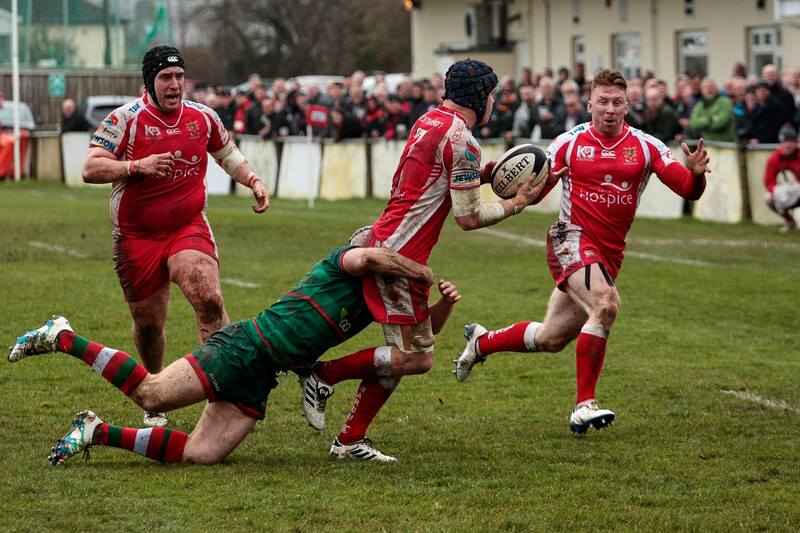 During this period, Barnstaple played and beat teams such as Swansea, Llanelli, Coventry and Saracens. The Club was declared ‘Champions of the West’ in the 1896/7 season. The Club’s greatest local rivals were Devonport Albion, and a crowd of about 8,000 attended Devonport’s ground to see Barnstaple lose by one try to nil in 1896/7. Since those times Barnstaple’s rugby has had fluctuating fortunes and in 1921 it moved from the field at Rumsam to its current ground at Pottington Road just a few minutes’ walk from the centre of town. After WW2 whilst Barnstaple Rugby was in hibernation the Mayor of Barnstaple called a meeting to reform the Club; thus proving the close link between the Club and the town that bears its name. Barnstaple has two senior teams the Chiefs and Barnstaple Athletic. Barnstaple Chiefs is the clubs 1st XV and plays its rugby in the South West Premier league whilst Barnstaple Athletic is the clubs Second XV and plays a vital role in developing young players for the intensity of First XV rugby and plays in the Devon Merit Table I.
Barnstaple prides itself on being a community club, with the majority of the players in the senior teams being local lads who have come up from the juniors, through the Colts into the senior teams. The Club has traditionally produced strong Colts teams and over the past 4 years the Colts have won the Devon cup on three occasions and have produced a number of very good players who have successfully transitioned to the senior squads. Barnstaple also has a very strong Juniors section which is always oversubscribed every season with in excess of 240 young rugby players on the books. The juniors have teams from Under 7’s through to Under 16’s, and there are the embryonic Girls Under 15’s and Under 18’s teams. The focus remains enjoyment and development through the junior section. These are the people writing the future history of Barnstaple R.F.C. As already mentioned Barnstaple Rugby Club has a fantastic atmosphere on match day with the huge and very vocal support which has amazed many visiting opponents who have regularly returned home with great memories of their day at Barnstaple. It also has a great club house which is often in great demand for weddings, birthday events and all manner of social celebrations throughout the year. The annual Roundtable Fireworks event in November see’s crowds of thousands both inside and out of the grounds to watch a fabulous display whilst during the off season there is always huge demand for the clubs services. Barnstaple Rugby Club is a great place to be anytime of the year whether it is watching the Chiefs excellent brand of rugby, enjoying the fun of junior rugby or socialising throughout the night, if you like to have a fun day out then come and see what we have to offer.